The impossiblity of time travel frustrates me. When I go on a vacation to the South Carolina coast, I wish I could travel to a condo that existed 100,000 years ago, so I could sit on a balcony and watch the now long vanished wildlife. The area near what’s now Charleston, South Carolina was home to a cavalcade of beasts equaling, if not surpassing that of today’s famous east African national parks. The old Magnolia phosphate mine, 10 miles north of Charleston, sparks my imagination because it was a spectacular fossil site that produced an impressive list of species, including some surprising ones. In 1865 union troops burned down the plantation house on the Runnymede estate. The owner, Charles Pinckney jr., desperately needed money to rebuild his estate. 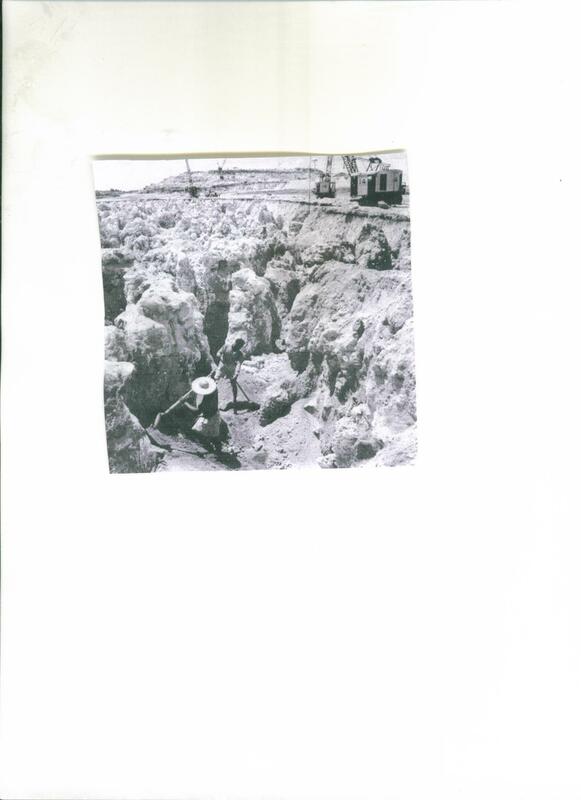 He began digging trenches on his property for phosphate nodules, and he also dredged the Ashley River, which bordered his property, for this lucrative resource. From 1869 to 1910 Mr. Pinckney mined the phosphate, but more interestingly, collected all of the fossils he encountered while working. In 1957 his descendents donated his 198 accumulated specimens to the Charleston Museum. The Pinckney family held on to the property until 1995, and now the Whitfield family owns it. They rent the property out for weddings and other ceremonies. It’s a beautiful piece of land with forests, picturesque lawns, salt marshes, a tidal river, and an amazing 1,000 year old oak tree. Unfortunately, the rebuilt plantation house mysteriously burned down in 2002 (was it the ghosts of union troops?). A satellite photograph reveals no fossil-bearing trenches which must have been filled in years ago. However, rivers are public rights of way. I suppose there’s nothing stopping modern fossil hunters from searching the nearby Ashley River for fossils, though scuba gear might help. The source of this rich assemblage of fossils is a geological strata known as the Wando formation–an ancient back barrier island structure that existed during a time of higher sea level. Part of the Wando formation sits on top of an earlier Pleistocene barrier island system known as the Penholoway, and another part of the Wando overlays the Oligocene formation. Scientists believe the Wando formation dates to between 130,000 and 70,000 years BP. This time period includes the Sangamonian Interglacial, when average annual temperatures were higher than those of today, and the early Wisconsinian Ice Age, when temperatures gradually began to cool but were still moderate. Early Ice Age winters along the South Carolina coast may have been even warmer than those of today. Based on the species found, the environment was a mixture of forests and savannahs. Apparently, the Wando formation is only four feet below the surface of the ground. It’s overlain by sand. Underneath, scientists describe the formation as a “blue mud” interspersed with rocks of phosphate nodules. A resident living north of Charleston may be able to find fossils, simply by digging in their backyard because remains of extinct species have turned up all over the region. The following is a list of species Charles Pinckney jr. discovered in his mines. I also give the scientific names for the extinct species. Noticeably absent from the list are small rodents, birds, and the beautiful armadillo. It seems likely that Mr. Pinckney didn’t notice small bones and only picked up the big showy fossils. A modern day team of scientists would surely recover remains of small rodents, reptiles, and birds. The beautiful armadillo commonly occurs in most southeastern fossil sites. I wonder why no specimens were recovered here. The two most surprising components of the Pinckney collection are the walrus and the stag-moose. Walruses are considered beasts of the far north but during the Pleistocene were more widespread. They occurred off the South Carolina coast when the climate was warmer than today’s, suggesting human hunting limits their range more than climate. 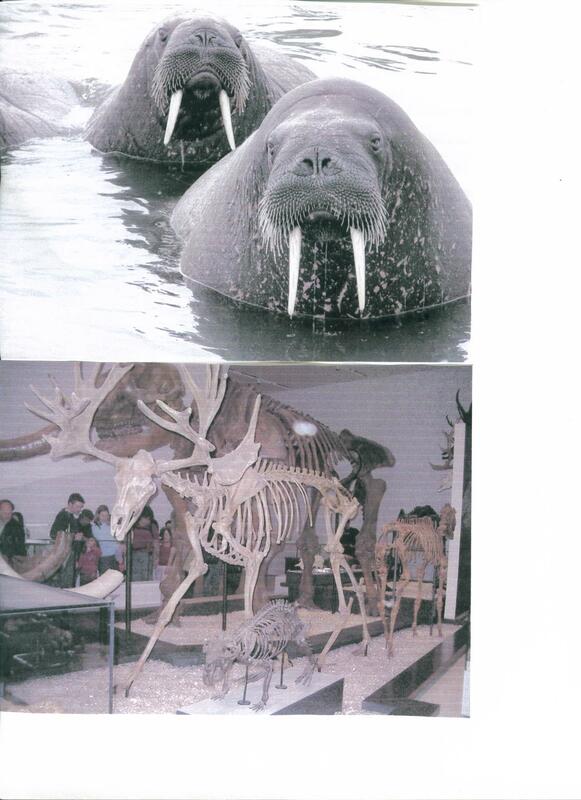 Photo of the walrus is on file from the Nunatsiaq Online–a Nunavut newspaper. Photo of the stag-moose skeleton by Saku Takakusaki. 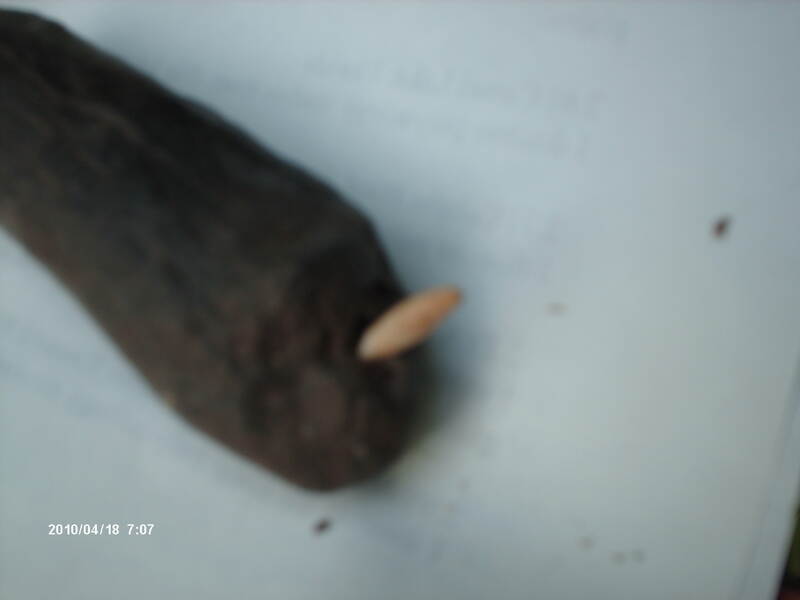 The stag-moose tooth that Mr. Pinckney discovered is the southern most record for this magnificent extinct animal. Hay originally misidentified it as a new species and gave it the scientific name Alces runnymedensis, meaning a moose named after the Runnymede Plantation where it was found. However, subsequent studies have determined that the stag-moose isn’t closely related to the modern moose, other than both being in the deer family. Later observations of the tooth determined that it matches that of a large species of extinct deer referred to a Cervalces scotti. Its common name is stag-moose or elk-moose. It was slightly larger than a modern moose, its head resembled that of an elk, but it had a totally different antler structure. This tooth is the only specimen of this species south of Virginia–it’s much more commonly found in northern states. Nevertheless, there was a population of this great beast as far south as Charleston, and I assume there were some in north and maybe central Georgia as well. Wow, what would modern hunters pay for the opportunity to go after one of these trophies? Burrowing Owl photo by Suranjan Mukherjee for the 2010 Nature Conservancy Calender. Range maps of the burrowing owl exhibit a curious distribution. They live in central Florida, 1500 kilometers to the west in states concentrated along a corridor of the shortgrass prairie region, and certain areas of the southwest from Texas through most of California. These diminutive owls are also found on the pampas of South America. They prefer prairie and dry scrub habitat. Because central Florida has an extensive area of dry scrub prairie type habitat, burrowing owls have been able to persist there, but at some times during the Pleistocene, this habitat must have been more widespread throughout the southeast, so that this kind of environment existed in patches connected to the bird’s current range in the west. Evidence from a new study provides tantalyzing clues to when eastern burrowing owls became isolated from western populations. Shaded areas represent current range. Cross hatching represents summer migrating populations. 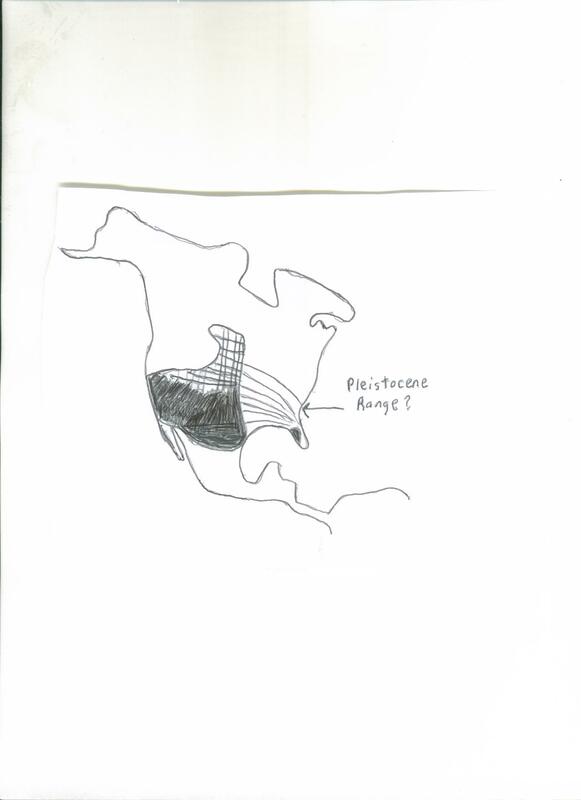 Curved lines represent possible Pleistocene range. 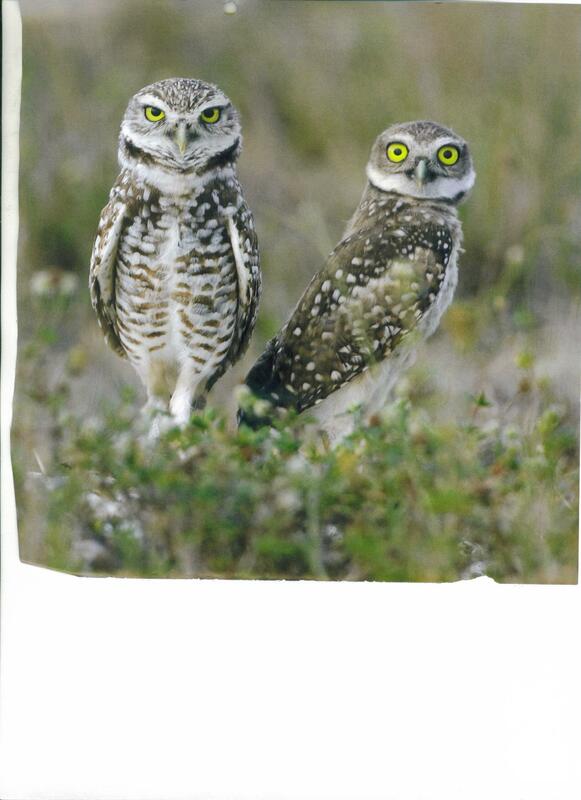 Ornithologists differentiate North American burrowing owls into two subspecies: Athena cunicularia floridana (the eastern subspecies) and Athena cunicularia hypugaea (the western subspecies). Recently, scientists analyzed burrowing owl genes and determined these two subspecies split about 350,000 years ago and have been isolated from each other ever since. (Other genetic studies suggest the split between Florida scrub jays and the western scrub jays, two species that occupy the same habitat as the burrowing owls, also dates to 350,000 years ago.) Although the time frame is not an exact match, the Stagell interglacial dates to about 420,000 BP to 395,000 BP, and I believe this is when the two subspecies of owls (and jays) were isolated from each other. The Stagell interglacial is unusual because of its length. Most interglacial periods last from 10-15,000 years, but this one lasted 25,000 years because of an extended period when earth’s orbit around the sun was circular, rather than elliptical. An elliptical orbit is one of the triggers of glacial periods. During an interglacial period, the climate becomes warmer and wetter, fostering the spread of the kinds of forested environments that burrowing owls avoid. Subsequent Ice Ages, or glacial periods, expanded habitat favorable to burrowing owls, but the corridor of their preferred habitat that connected the southeast with the west was never re-established. Incidentally, this may have influenced cheetah distribution as well. Rare cheetah fossils in the east date from before the Stagell interglacial, but not after. I believe burrowing owls were more widespread throughout the southeast during the Wisconsinian Ice Age (~118,000-11,000), even though forests blocked the recolonization of some areas, but fossil evidence supporting my hypothesis may not exist. Burrowing owls choose dry upland habitats away from river bottoms where floods might have buried their bones. And they didn’t inhabit the well forested mountains, near where caves (another source of fossils) existed. Opportunities for fossilization of burrowing owls in most of the southeast outside Florida were minimal. However, other western prairie-loving species are known to have inhabited the southeast during the last Ice Age, including 13-lined ground squirrels, badgers, coyotes, prairie chickens, and upland sandpipers. If habitat existed for these species, it did for burrowing owls as well. Moreover, in Georgia there were lots of extensive sand dunes that would have supported the scrub-like habitat burrowing owls now inhabit in Florida. There is an interesting behavioral difference between eastern and western burrowing owls. The former dig their own burrows, but the western subspecies has completely lost this ability and is wholly dependent upon the burrows of prairie dogs, ground squirrels, armadilloes, and other creatures. These interesting creatures are under threat from urbanization. Let’s hope man can prevent their extirpation. The following is a compilation of facts about burrowing owls I thought fascinating but didn’t pertain to the above essay. –Their burrows can be as little as 6 inches below ground or as deep as 3 feet. –They hide the scent of their burrow with manure of other animals. –Their young make rattling noises similar to that of the rattlesnake. This wards off predators. –They’re small owls–only reaching 11 inches tall, and they’re related to a few other species found around the world–all small. –They mostly eat large insects, such as grasshoppers, but they also consume rodents, birds, lizards, snakes, crayfish, and carrion. –Burrowing Owl habitat in Florida expanded following real estate development and the felling of forests. They moved into vacant lots, golf courses, and airport fields. —One study found that burrowing owls increase in suburban neighborhoods that are 45%-60% developed but decline when neighborhoods reach 70% development. –An extinct Pleistocene species of burrowing owl was the dominant upland predator on Cuba and other Carribean islands. It grew to an astonishing 3 feet tall. It became extinct the same time man colonized the islands. One of the Fossil Forum moderaters recently let me have a bag of fossils. Among the specimens was a partial dugong rib. The dugong of the North Atlantic ocean was a sea going manatee that probably went extinct about 3 million years ago when South America drifted close enough to North America to form a land bridge. This geological transformation disrupted ocean currents and probably is the cause of a major marine extinction event. Upon examining the dugong specimen, I noticed what I thought for sure were gnaw marks made by some small carnivore. I happen to possess a house cat skull. 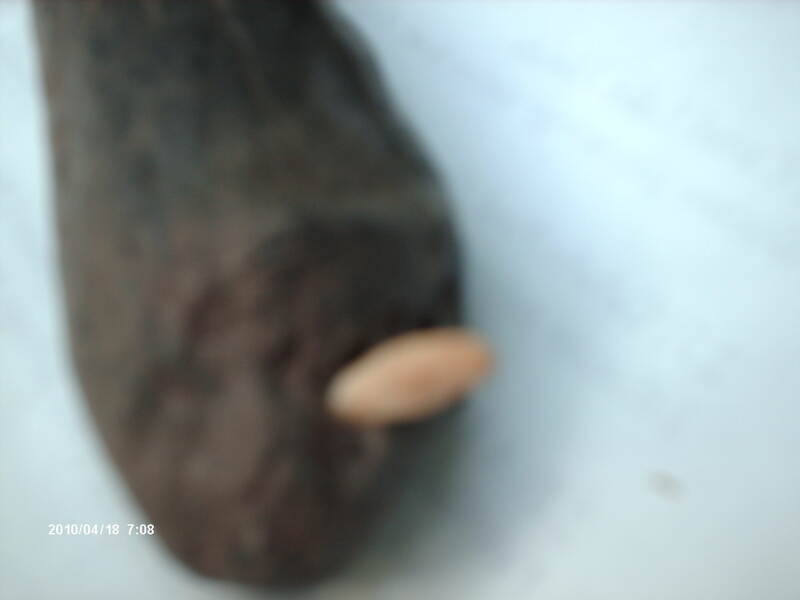 The teeth and jaw span exactly match what looked like canine puncture marks on the specimen. I couldn’t find much information about small carnivores of the Miocene and Pliocene, so I contacted Dr. Richard Hulbert of the Florida Museum of Natural History and described the specimen to him in order to come up with a list of possible culprits. Dr. Hulbert is the author of Fossil Vertebrates of Florida and dozens of articles in scientific journals. 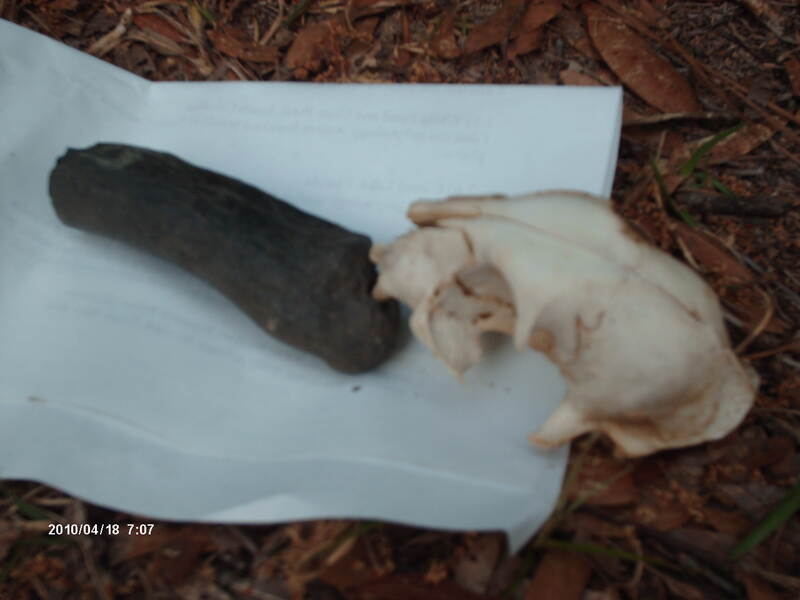 He informed me that a small carnivore couldn’t bite hard enough to make canine puncture marks in a dugong bone. Instead, the holes and marks were probably made by marine invertebrates that use enzymes to bore through rock in much the same way shipworms (Teredo navalis) do to wood. This looks like gnaw marks but were probably made by marine invertebrates. Note the canine-like puncture holes. House cat skull is a perfect fit for burrow marks probably made by a clam or worm. Canine tooth is a perfect fit for both holes that were probably made by worms or clams. I was aware of bioturbation. Bioturbation occurs when animals burrow up and down sediment. Some times this activity mixes sediment from different ages and can cause problems for scientists when they try to date strata. But I didn’t realize these invertebrates also burrow through rock (and fossils). I researched more about rock borers and discovered that there are an astounding 8 superfamilies of rock boring clams, including pholadidae, the piddock clams. Some species prefer boring through soft rock, others hard rock. They make popular aquarium pets. Some aquarium owners complain that the clams move around too much when placed on a sandy substrate. These people don’t realize the clams are searching for a rock to bore into and won’t feel safe until they find one. There are also rock boring worms and sea urchins. Worms, as well as wind and water, are the elements that can erode fossils into nothingness. This makes the survival of any recognizable fossil all the more remarkable. In today’s blog entry I’m just going to toot my own horn. I was shopping for books on amazon and discovered that my book is on sale there now. Just go to www.amazon.com and type in the title–Georgia Before People: Land of the Saber-tooths, Mastodons, Vampire Bats, and Other Strange Creatures. Man nearly extirpated beavers from Georgia by the end of the 19th century, much as he did other integral members of the state’s fauna such as the white tail deer. But just like the deer, beavers staged a remarkable comeback and are now of a pestiliferous population. During the Pleistocene before any humans were here to hunt this interesting animal, there must have been sizeable numbers of them in the environment, and they shared this ancient land with another larger species, the giant beaver (Casteroides ohioensis). The habits of modern beavers (Castor canadensis) are well known to science, but knowledge of the extinct giant beaver is limited. Here’s what we do know about Casteroides: It weighed up to 400 pounds, averaging about 8 times larger than the still extant species. It sported a longer, narrower tail than modern beavers. And the teeth were adapted to a diet of aquatic vegetation vs. the mostly woody plants the smaller species prefers to eat. Giant beavers were widespread–their fossil remains found throughout the midwest and southeast, including a few specimens found in Georgia from Chatham and Glynn counties near the coast. We do not know for sure whether giant beavers built dams like their smaller cousins. The available evidence seems unclear. Here, I divide the evidence in favor and against the possibility the giant beavers built dams. Evidence favoring the hypothesis that giant beavers built dams. 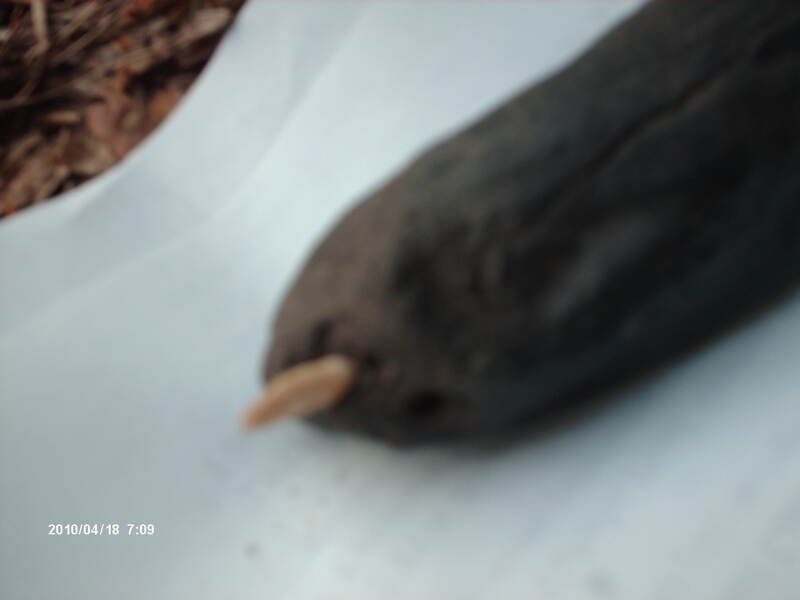 Fossil evidence at a Pliocene-age site on Ellsemere Island in the Canadian Arctic conclusively proves that Dipoides, an extinct species of beaver closely related to Casteroides, did build dams because the dam itself was actually found with specimens of Dipoides, and the chewed wood matched the teeth marks of this species. Dipoides had teeth even less suitable to chewing wood than Casteroides, yet it did build dams from felled trees. If a species like Dipoides, which was closely related to the ancestor of all aquatic beavers, built dams, than dam-building is an ingrained behavior for all beavers, and Casteroides must have built dams to. Evidence against the hypothesis that giant beavers built dams. 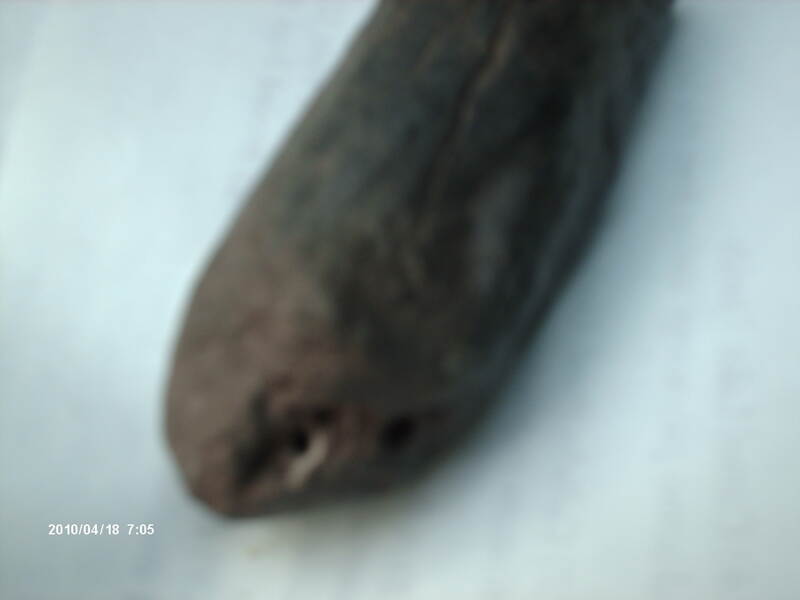 Its teeth were not at all adapted for chewing wood. Isotopic analysis of Casteroides’ fossil bones from one site suggests they lived on a diet consisting exclusively of sedges, and nodding water nymph, not wood. Giant beaver fossil specimens recovered from the Erb site in Wisconsin date from a time when the local environment was an open marsh with few trees; fossil speciemens of the smaller beavers at this site date only from a time when the local environment became a closed canopy woodland. This data indicates habitat differentiation and suggests that giant beavers preferred sparsely wooded habitats where few trees existed for dam-building as opposed to the closed canopy forests preferred by the smaller species. I theorize giant beavers did build dams in some circumstances but were not as dependent on them as Castor canadensis is and could occupy habitats not suitable for the smaller species. Some scientists suggest giant beavers became extinct because our extant beavers outcompeted them. This makes little sense. The two species co-existed for at least 2 million years. Moreover, beavers and giant beavers apparently preferred different habitats, the former preferring closed canopy woodlands, the latter open canopy marshes. The smaller species actually created habitat favorable to Casteroides when they gnawed down trees and dug canals, thus expanding the size of the open wet meadows the giant species liked. If any species competed with Casteroides, it would have been the muskrat, because they eat many of the same plant foods. Muskrats today thrive in many aquatic habitats. To me, this shows that habitats favorable for giant beavers are still available. The main survival differences between muskrats and giant beavers are the larger size and slower reproducing capabilities of the latter species. Casteroides couldn’t survive human hunting pressure, while smaller, faster reproducing species such as the muskrats and extant beavers could. Beaver meadows and ponds must have abundantly dotted Georgia’s Pleistocene landscapes, especially during wetter interstadials (warm moist climate cycles during Ice Ages) and interglacials. Beavers not only created ponds for aquatic life, but they also create meadows. The longer a beaver dam is maintained, the more the number of surrounding trees get gnawed down until after many years the area is converted to a meadow. In this self created landscape when trees become scarce because of their own tree-destroying habits, beavers avoid traveling great distances overland where they’d be vulnerable to predators, by digging canals to wooded patches that are farther away from their home lodges. In this way they expand meadows even more. In Pleistocene times this meant they increased habitat for mastodons, mammoths, horses, bison, deer, and elk, as well as the aquatic life already flourishing in the ponds and canals. I’m sure if we were able to take a time trip back to Pleistocene Georgia, we’d find both species of beavers, perhaps even living side-by-side. See also google images for pictures and illustrations of beaver dams, beaver lodges, beaver meadows, and fossil specimens of giant beavers. You are currently browsing the GeorgiaBeforePeople blog archives for April, 2010.